support – Dancing in the rain! I don’t really believe that there is women’s work and men’s work. I believe that gender roles should be equal but that being said somehow in my marriage we fell into more of traditional roles and I have been lucky enough to not have to get my hands dirty changing my oil, changing tires or taking out the toilet all three times our children decided to flush something that didn’t belong. 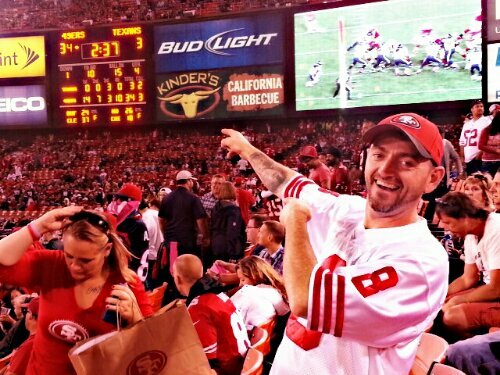 About a year and half ago I quit my job. My husband and I thought it was important that I have more time for our children with him away. Initially trepidatious I agreed it was for the best. I do some work from home and I am a volunteer board member for a local league. I am a full time wife, mother, cook, taxi driver and role model. Do not misinterpret this to mean that I love picking up dirty socks or dirty dishes. I don’t and I can safely say that though my family does not readily change their heathen ways it is not from lack of trying. My displeasure is known and though it would be easier I don’t do it for them. If I have to ask ten times it gets louder everytime and eventually the socks will get picked up. My husband is away for work more then he is home and I know when he is there everybody wants a piece of him. His phone rings steady, people are in his ear and he is responsible for a crew of young guys that he affectionately calls his kids. One day last week I was on the phone bitching to him about trying to get our daughter out of bed for school and he asked if I would like to trade him and get five thirteen year olds out of bed in the morning. I changed the subject of the conversation. Both if us have our roles and he is exceptional at his and I handle mine. Sometimes we struggle silently because part of our roles as husband and wife is too lift each other up, not weight each other down with complaints. When you live apart from each other sometimes part of supporting each other is learning to lean on yourself. It’s a unique situation for certain and I don’t know that I will ever master it but I know that I won’t stop trying. I know that my husband doesn’t tell me everyday how lonesome it gets living up North, how hard it is to miss your childrens special moments and get up and go to work each day, everyday knowing how many people are depending on him. In turn I try to make sure that all the business here gets taken care of. The children are fed, educated and active, I volunteer at their school and their league, the business paperwork is done on time and I teach our girls about hard work, about integrity, about accountability and about the value of a dollar. I try to have a little life for myself because it is important for me and for them to see. Our roles are very different but equally important. 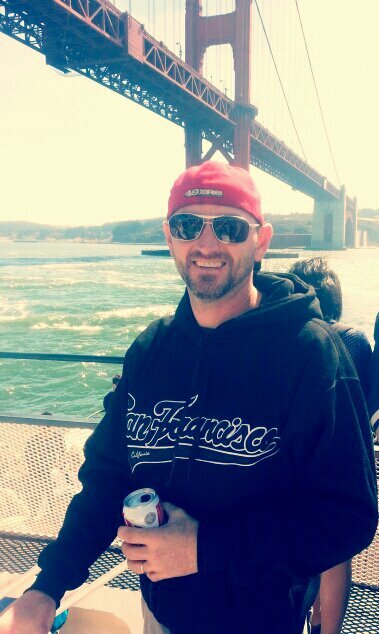 I know I miss Kirk somedays more then I say and I definitely appreciate him more then I could ever express. I know that he makes our lives possible and in turn we make his possible. We are all doing our best and continuing to learn. I do not define him nor he me but I believe that we make each other better! Our kids are growing up with a family that doesn’t all get to sit down at the dinner table together every night but they are being given opportunities that neigher my husband and I had as children. Families don’t fit into a little box like they used to. That perfect fifties style family with the Mom serving dinner in a dress to a suit and tie dad while her well groomed children say their prayers and talk about their day over meatloaf and pie! Tell me about your unique family! 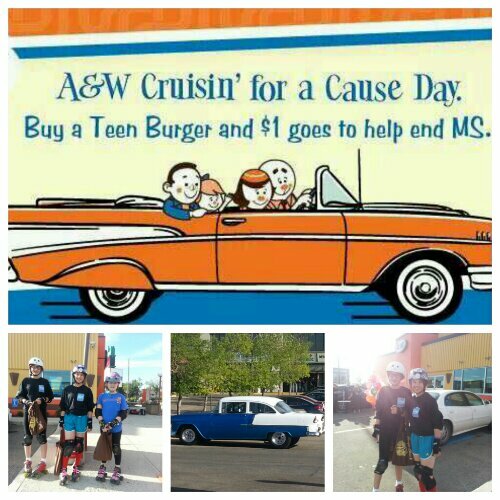 This is a quick post while I am at A&W volunteering with GEJRDA to help support the fight to end MS. This is the third year we have been involved with this cause. MS is an ailment that affects Canadians at a higher then average rate. 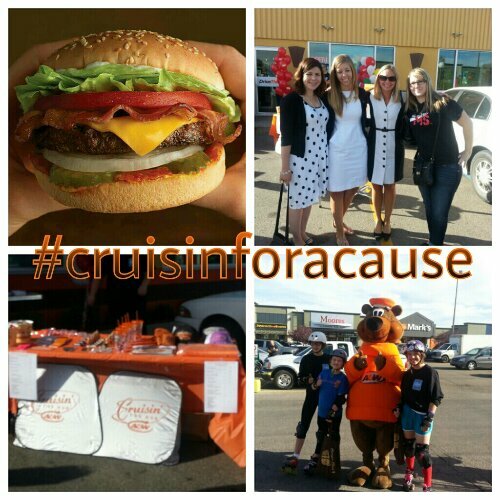 Cruisin for a Cause is an initiative that unites the Cruising History of A&W, along with it’s delicious burgers and The MS Society of Canada’s goal to find a cure for MS. Last years cruising for a Cause raised 1.3 million dollars in support of ending MS.
$1 from every teen burger sold today at A&W will go towards ending MS. Every tweet with hashtag #cruisinforcause A&W will donate $1 up to $20k. Greater Edmonton Junior Roller Derby girls will be on location at White Oaks Square from 5-9 pm this evening. Come say Hi, Eat and tweet. We ROCK therefore we ROLL! !